Sanskriti Group of Institutions had organized a corporate meet on 14 June 2015 at its campus at Chhata Mathura CEOs and Senior Executives of all reputed companies in and around Mathura & Agra were invited. At least one of the Senior Executive from each company attended the meet. 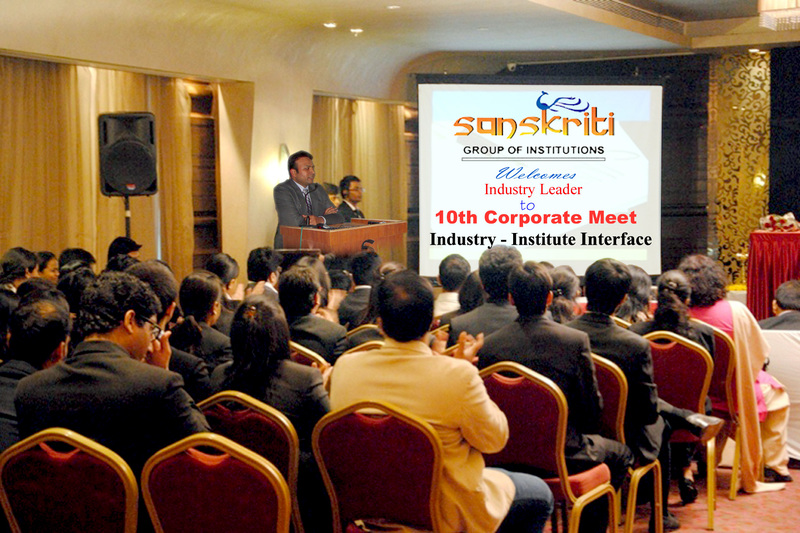 Sanskriti Group organizes such corporate meet twice a year. The idea of organizing such meet is to interact with the CEOs and Senior Executives from all reputed organizations of Agra – Mathura region. Such occasions help the management of Sanskriti Group to meet the captains of the industry in a single platform and exchange notes on different issues relating to future of the organizations, their short-run & long-run plans, employability etc. Every year the different companies conduct campus placement drives in different institutes of higher education and after scouting the students, the most employable candidates are offered jobs. Sanskriti Group realizes the fact that it’s essential to keep the leaders of the industry updated about its activities so that they can appreciate (a) the efforts taken by the institutions under the Group for imparting the holistic education and (b) relate the grooming process with different parameters of the jobs the students are required to perform after their appointment. Employability is the serious point of concern for the industry and Sanskriti Group takes steps for grooming the students appropriately by conducting courses in personality development, English communication etc. The Group also conducts seminars, conclaves, guest lecturers etc. regularly to provide necessary exposure to the students on co-curricular activities. Innovative methods of teaching are adopted to make the teaching learning process interesting. In the corporate meet held on………., the CEOs and Senior Executives of different companies like Pepsi, Coke, Shoe exporters from Agra, CEOs of Spinning mills etc. updated the gathering with their views about the prospects of growth of industry in India in general and the scope of growth in specific industries in particular. They also gave a feedback about the observed short comings of the students employed by them and made a mention of the essential requirements that they want in a candidate so that return on investment is justified. At the outset, Mr. Sachin Gupta, Chairman of Sanskriti Group of Institutions, extended a hearty welcome to all CEOs and Senior Executives who had responded to the invitation and were present in the meet. He informed the leaders of the industry that Sanskriti Group is trying its best to ensure that passing out students are well groomed. He also assured the gathering that continuous improvement will be made in co-curricular activities to keep pace with the change in environment. Prof. P.C.Chhabra, Executive Director of Sanskriti Group of Institutions, thanked all the invitees for their presence and expressing their view points about the present status of the industry and their suggestions for improvement through continuous industry-institute interface. The guests were shown a PPT presentation and video recording of the activities of the Sanskriti Group. The industry heads appreciated the steps taken by Sanskriti Group for grooming the students properly. Those attending the meet also discussed specific issues on one-to-one basis with the Chairman/ E.D Sir and Senior faculty members of Sanskriti Group of Institutions as new ideas emerged from the meet from deliberations of CEOs/ Senior Executives. Mr. Sachin Gupta said he will take their advices seriously and try to implement the same with full sincerity. A dinner was hosted by Sanskriti Group on this occasion. The meet was extremely successful as could be judged by the expressions and comments of the distinguished Guests. Disclaimer: The information provided in this Notification is solely by Sanskriti Group., Jagranjosh.com bears no representations or warranties of any kind, express or implied, about the completeness, accuracy, reliability, suitability or availability with respect to the information. Individuals are therefore suggested to check the authenticity of the information.